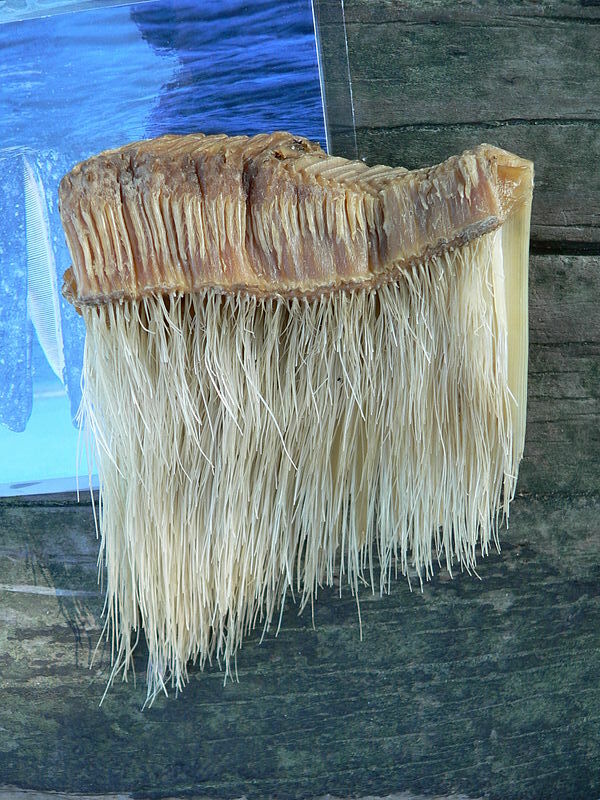 A section of baleen. David Monniaux photo via Wikimedia Commons. n, from the Greek and Latin for “whale”) As an adjective, belonging to Order Cetacea, the catagory of marine mammals that includes whales, dolphins and porpoises. As a noun, a marine mammal in that order. Ba·leen (bə-lēn‘) , from the Middle French for “Whalebone”) Bristle-like structures in the mouths of baleen whales, used to strain plankton from seawater, composed of keratin, similar to the material that makes up humans’ fingernails and hair. Also called “Whalebone,” once used to make brushes and corsets. Baleen Whales There are 15 species of baleen whales, including blues, humpbacks, fins, minkes, pygmys and southern rights. Toothed Whales There are 35 species of toothed whales, including beakeds, melons, orcas, pilots and sperms. Principal sources: Oceans Alive (www.abc.net.au/oceans/alive.htm); American Heritage Science Dictionary; Encyclopedia Britannica.